I’ve had many stressful experiences in the past buying a car. At Videon it’s was one of the most pleasant experiences we’ve had. Our salesman Mike was so nice and very knowledgeable. It’s was pretty effortless. We are so happy with our purchase. Thanks Mike! And a shout out to Pete also who handled all the finances. Didn’t feel any pressure to add on services. It’s was quick and easy. I had gone to a number of dealers and Steve Pealer took the time to find the exact vehicle I was looking for. The price was beyond fair and it was the best car dealership experience I had ever had. I would recommend always going to Videon. I never write reviews-but we had such a night and day experience with this dealership and the next one we visited that I feel I have to write reviews for both. We met with Phil Snyder, who was professional, capable, and very patient with all my questions and our two small children who accompanied us. Side note: the kids play area here is clean, well-stocked, and fantastic. The television was off to the side (not in the area itself), the toys had all the pieces (my 2-yo appreciated that), and it was in easy proximity to the restroom. Phil took time to sit down with us and understand our wants and needs, choose car models carefully, and brought up two different models for us to test drive (and came with us to explain features). And the test drive! Rolling green countryside on back-roads with bumps and varying speed limits and real test conditions. Fantastic. Highly recommend this dealership for their service and quality. Thank you Phil and Videon! My wife and I went to several auto dealers over the course of 2 days looking for the perfect car for her. It became clear that her top choice would be a Jeep Wrangler. We went to several Jeep dealers and found the people at Videon to be the nicest with the best deal. When you pull in you can see the cars. The cars aren't all jammed in like sardines. When you get out of your car they immediately came outside to greet you (most dealers don't do that any more). Dan was a GREAT salesman and was able to answer every question and go over every feature. She has had the car for 2 weeks now and Dan has checked back to make sure all is good and answer any questions. She LOVES the Wrangler. We would HIGHLY recommend that you go to Videon for your car. Super helpful service. Nice waiting room and kept me updated on the status of my vehicle. Great service and very professional people.Treated with respect. 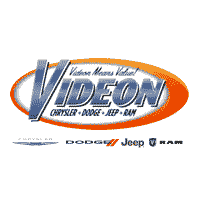 When looking for excellent service and great deals on Chrysler, Dodge, Jeep, or RAM vehicles, Videon is just the place. Our Newtown Square lot is home to a wide inventory of quality new and previously owned vehicles. All vehicles are offer excellent value, are thoroughly inspected, and available with great pricing and financing options. The team at Videon offers every opportunity to get your dream vehicle at the best price possible. Whether it’s the dozens of new specials that we’re constantly rolling out, the great leasing incentives, or the attractive financing packages made possible by our car loan specialists, you’re sure to find a car that is both safe and affordable. Our sales team makes the process an easy, enjoyable experience. Our service doesn’t end once you leave the lot. In addition to providing the highest quality vehicles to our customers, we also offer regular service and maintenance as well as parts for your Chrysler, Dodge, Jeep or RAM. We want to make sure that your vehicle is dependable on the road for years to come. Looking to find out more? We invite you to stop by the Videon lot in Newtown Square, where we can keep the conversation going. Of course, we can also be reached by phone or email with any questions.